When it comes to Internet accessibility, having a strong Wi-Fi connection is just the beginning. What's the use of even the fastest internet speeds if you can't read the words on the page? Even if global access to Internet becomes a reality, language barriers make complete accessibility an impossibility. Language diversity, or lack thereof, is a major problem on the web. Only 5% of the world's 7,100 languages are accessible on the Internet. Though about 80% of those languages are spoken by 100,000 people or less, this is no doubt a sizable problem when it comes to the goal of global connectivity. In a survey of the top 10 million websites on the web, almost 55% of sites used the English language to deliver their content. Yet, only 360 million of the 7 billion people worldwide speak English as a first language. In comparison, 1.2 billion people speak Chinese as a first language — yet, Chinese is only the main content language of 2.2% of websites. That’s all not to mention Hindi, the fourth most commonly spoken language globally, which is used by less than 0.1% of websites. The lack of language diversity on the web, according to some activists, is aiding in making lesser known languages obsolete. These languages, markers of culture and identity, are a way to construct a collective sense of belonging, providing a direct connection to history. When languages die, a part of culture dies — and preservation of culture is an important global goal. 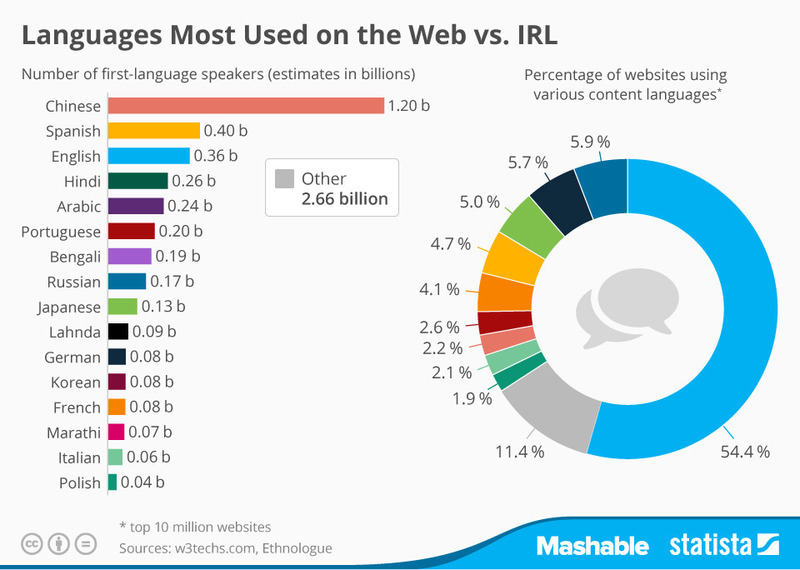 The following chart, created by statistics portal Statista, visualizes these disparities in language access, showing how languages are represented in real life versus across the web’s top 10 million most popular sites.